If you just discovered this blog, this is Part 3 in a series on growing tomatoes in the home garden. Check out Part 1 (intro) and Part 2 (pruning). 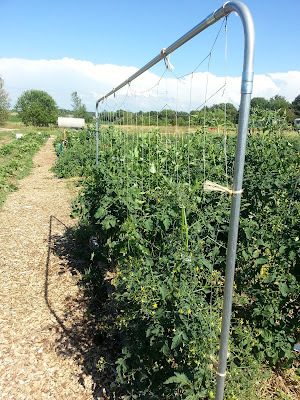 There are several reasons to trellis tomatoes. Determinate tomatoes, also known as "bush type" tomatoes, have a generally upright postion while growing and bearing young fruit, stop getting bigger but tend to flop over as fruit matures and gets bigger. Indeterminate tomatoes, on the other hand, never stop growing. Check out good old Wikipedia for more info on tomato classification. soil splashing on leaves, which can infect the plant with early blight. keeps plants tidy, out of paths or from crowding other plants. keeps fruit up off the ground away from the soil (potential rot issues) and animals (though chipmunks climb into my plants to steal fruit anyway). Trellising also helps increase airflow and sun exposure, both of which help decrease the likelihood that a fungus will attack the plant. plot, need to be trellised to keep them in line. Finally, good trellising will keep plants from touching one another so you don't get those back seat arguments that start with "Mommmmmm, he's touching me." Seriously, keeping plants from touching can reduce disease transmission from plant to plant. Here's a great resources from our own UW-Extension on growing tomatoes in Wisconsin. If you'd like to learn more about growing veggies in person, check out Madison FarmWorks and their Urban Gardener series of classes. It's one thing to read a blog post, it's another to get into the field, see their best practices in action and most importantly, ask questions.